Here’s a fair question: how long would you guess hanging a single picture on the wall may take? Thirty minute to an hour? 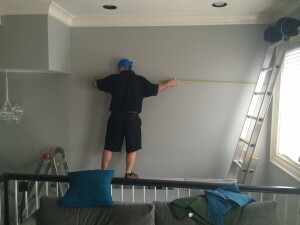 As a professional offering Art Hanging Services my answer would be it depends. The following job took exactly 2 hours and 45 minutes for completion. The actual hanging part was simple: less than 10 minutes measuring, tracing and placing picture hangers. The large portion of the time was spent planning and setting up the stage. Since this home is located in downtown Boston in the South End, I had to bring a 24′ extension ladder from the alley into the back door and lay it against the long wall. 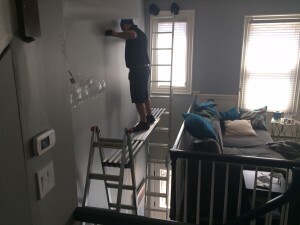 But not before protecting the top portion of it with padding to avoid dents and scratches on the wall and wood work. Next, I brought in the front door a multi-positioning ladder and placed it on the landing part and steps. Third, I’ve placed a expandable 9 feet plank between ladders to create my working area. 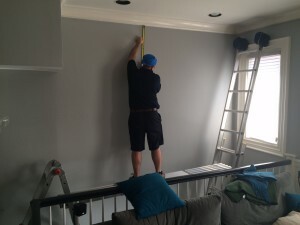 After moving the plank higher to set it at the proper height and ensure all the equipment was safe and secure, the ‘hanging the picture’ part was quick. 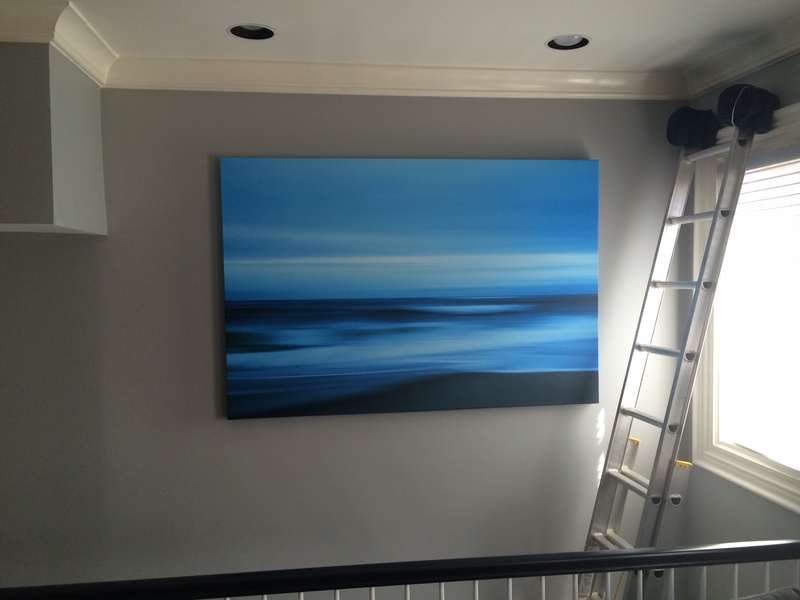 The picture was hung evenly between the banister and crown molding and equally spaced width-wise between walls. Needless to say that the wife was very happy since the husband had it on his ‘to-do list’ for over two years. #2. The homeowners were in the room watching me the entire time, which could potentially have made me very uncomfortable being watched, but it didn’t. We also hang mirrors, family photos, expensive art and other wall decor pieces such as antique doors and more. Plantation Shutter for Palladium Window in Mansfield, MA A memorable surprise!